We arrived at the Osa Peninsula by late morning and stocked up with groceries before heading along a rough road to the other side of the peninsula. The end of the road brought us to a small town called Carate – well I’m not sure if it’s really a town. More like an extremely small settlement of a few houses and no stores! We camped near the beach, made dinner, and played cards with Ben and Lisa. Lisa’s the card shark and Robin is her partner in crime. Ben and I are just the Card Champions of the World! The following morning, we set off for a 3km hike along the beach to the entrance to a National Park. 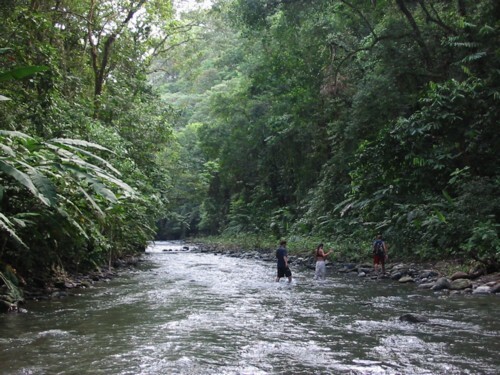 The park is a large isolated chunk of land that takes up a big portion of the Osa Peninsula. We spent the whole day hiking in the park – we started off along the trail which followed the beach – but we soon turned off the trail and followed a big river into the inner depths of the park. Actually, the park is so big, it would take a day or two to explore the inner depths! 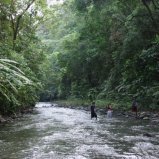 We followed the river for a few kilometers looking for waterfalls and wildlife. We didn’t see much of either, but it was really beautiful! We returned to the main trail where Ben and Lisa headed back to Carate for a swim in the ocean and Robin and I continued along the trail further. Robin soon spotted a beach and stopped to take a nap and I hiked a further 2 kilometers or so. We saw all four different monkey species in Costa Rica in the park – Howler Monkeys, White-Faced Monkeys, Spider Monkeys and Squirrel Monkeys. We also saw a bunch of cool birds and other wildlife. We returned to Carate to eat dinner and play cards again!